Criss Cross Menthol Filtered Cigars, offer a refreshing blend of minty flavored high-quality premium tobaccos packed inside a homogenized tobacco leaf wrapper. Measured at 3 ⅞ inches in length, ring gauge of 20. 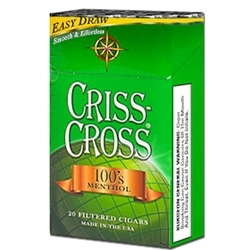 Criss Cross Menthol Filtered Cigars are available in Box 100's and packaged 20 cigars per pack, 10 packs to a carton for a total of 200 premium filtered cigars.